iPad and iPhone musicians often ask for a decent reliable powered UBS hub for all their devices and controllers. 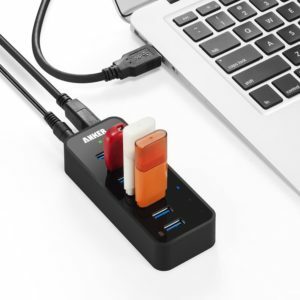 We recommend the Anker 7 port UBS hub. Anker 7-Port USB 3.0 Data Hub with 36W Power Adapter and BC 1.2 Charging Port for iPhone 7 / 6s Plus, iPad Air 2, Galaxy S Series, Note Series, Mac, PC, USB Flash Drives and More. Light and Compact: Palm-sized and lightweight (2.9oz) for greater convenience. Huge Expansion: Enjoy super-fast transfer rates of up to 5Gbps for up to 7 devices—simultaneously! High-Speed Charging: 7th port provides a 2 amp high-speed charge and combines with the other 6 ports to deliver a total 6 amp charge. Broad Compatibility: High-grade chipset and adapter guarantee stable operation, including plug-and-play and hot-swapping functionality. Works flawlessly on Windows XP/Vista/7/8/10 and Mac (OS X [10.2 and above]).What You Get: Anker USB 3.0 7-Port Hub, 12V / 3A power adapter, 2.7-foot USB 3.0 cable, welcome guide, 18 month hassle-free warranty.